MSRP: Starting at $87,115 USD. Click and drag inside the image to pan around the inside of the coach. From the color of the decor to the design of the driver’s seat, Fleetwood’s Terra SE has paid attention to every detail. The Fleetwood line builds their motor homes for comfort and convenience so you are always ready to sit back, relax and put your feet up (unless you’re driving, that is). 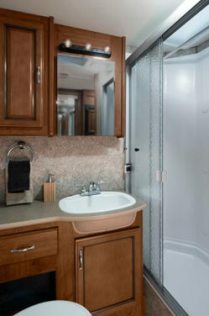 Every Fleetwood RV has the special touches that make it feel like a home. With such roomy interior spaces, it’s easy to forget that the Terra SE is filled with many safety features. 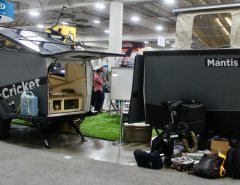 They may be out of sight, but they’ll give you of peace of mind you need while on the road. 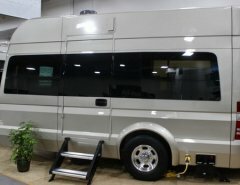 Fleetwood builds motor homes using superior construction techniques, to ensure you will keep moving for many years to come. As the driver, the Terra SE makes sure you’re taken care of, too. With plush seating, plenty of lighting and technology at your fingertips, it might just be the best seat in the house. Residential-style touches and handy features make a Fleetwood RV much more comfortable than your typical campsite. The comfy beds let you sleep snugly, while built-in nooks and crannies give you space to stash your stuff. After all, what’s the point of traveling if you can’t get some quality R and R? The Terra SE let’s you take it all with you. With ingeniously designed storage solutions, you’ll always have your luggage safe, secure and stowed away within easy reach. 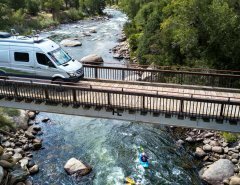 Whether you’re moving down the road or setting up camp, every Fleetwood RV is outfitted with unique exterior features to keep you safe and secure.